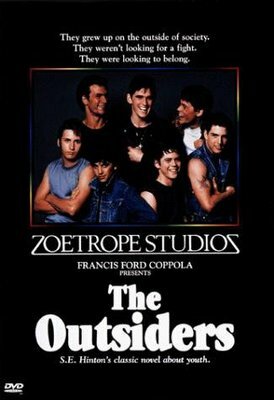 The popular movie The Outsiders was filmed in Tulsa and stars Matt Dillon, Patrick Swayze, Tom Cruise, Rob Lowe and Emilio Estevez. With a variety of diverse landscapes and a history of welcoming award-winning film crews, Oklahoma has established itself as a first-rate filming location. Some of America’s favorite movies, from period pieces about the Great Depression to modern classics you’ve probably seen in theaters, were shot in Oklahoma. Hit the road to see where superstars and famous directors worked to create the following films. Set in Oklahoma’s beautiful Ozark Mountains, Where the Red Fern Grows is a coming of age story about a young boy who trains two hunting dogs during the Great Depression. The screenplay was based off the children’s book of the same title by Oklahoma author Wilson Rawls. 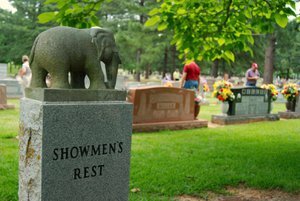 The popular 1974 movie adaptation was filmed in Vian and Tahlequah, where visitors can attend the annual Red Fern Festival, a send-up to the novel that features hound dog trials, 1930s-era children’s games and tours of the movie’s filming locations. Watch the movie and you’ll also catch a glimpse of the waterfall at Natural Falls State Park. Travel to the town of Wakita in far northern Oklahoma to visit filming locations from the 1996 blockbuster Twister, a movie that chronicles the nail-biting adventures of Oklahoma storm chasers. Visit the Twister Museum to view movie memorabilia and learn about the tricks of the movie-making trade. Also, tour the town to see the site of Aunt Meg’s house and the town’s water tower, which was featured in one of the film’s dramatic fly-over shots. Norman’s Owen Field made it into the film and Helen Hunt stayed at the Montford Inn Bed & Breakfast during filming. The Dust Bowl and the great Okie migration west during the Great Depression were beautifully captured in John Steinbeck’s 1939 novel The Grapes of Wrath. It was quickly adapted into an Oscar-winning movie of the same name by director John Ford. Starring Henry Fonda, the film tells the story of Tom Joad who is forced to move his family from Oklahoma to California after his farm turns to dust. The Beckham County Courthouse in Sayre makes an appearance in the film as the Joad family journeys along Route 66. The ensemble cast of August: Osage County came together in the Oklahoma towns of Pawhuska and Bartlesville to turn Tulsa-born Tracy Letts’ play into a piece of award-winning cinema. Julia Roberts, Meryl Streep, Ewan McGregor and the rest of the cast convened in rural Pawhuska for much of the principal photography. Set in Osage County, you’ll also see shots of Tenkiller State Park in this emotional movie about family and returning to your roots. The Killer Inside Me may be set in a small town in Texas, but this crime drama was mostly filmed in Oklahoma. Movie stars Jessica Alba, Casey Affleck and Kate Hudson traveled around the state filming in Guthrie, Enid and Tulsa. 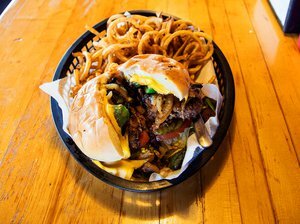 Oklahoma City also played backdrop for this tense thriller set in the 1950s and Cattlemen’s Steakhouse in Historic Stockyards City was even the location for Max’s Restaurant. A pillar of 1980s cinema, The Outsiders was based off Oklahoma author S.E. Hinton’s novel and filmed completely in northeastern Oklahoma. This story of Ponyboy and his gang of Greasers was brought to life in Owasso, Skiatook and Tulsa by director Francis Ford Coppola. The Admiral Twin Drive-In was used as the backdrop for the characters’ 1950s hangout and is still in operation today. A pillar of 1980s cinema, The Outsiders was based off Oklahoma author S.E. Hinton’s novel and filmed completely in northeastern Oklahoma. Author S.E. Hinton’s characters made it to the silver screen again when Rumble Fish was filmed in Tulsa in the early 1980s. The star-studded Rumble Fish cast including Matt Dillon, Mickey Rourke, Diane Lane and Nicolage Cage plays out their characters’ tumultuous relationships on the streets of downtown Tulsa and Sapulpa. Look for what is now the Tulsa Arts District in this black and white adaptation of Hinton’s novel. Director Terrence Malick, who once called Oklahoma home, brought his talents back to the heartland in the 2012 film To the Wonder. Starring Ben Affleck and Rachel McAdams, this love story unfolds amidst the breathtaking scenery of the Tallgrass Prairie Preserve in Pawhuska and the Pawnee Bill Ranch Historic Site & Museum in Pawnee. You’ll also see a bit of Bartlesville, including the architecturally stunning Bartlesville Community Center, in the movie as well. 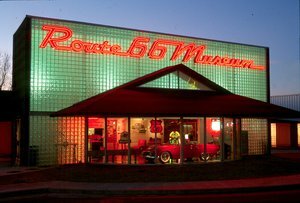 While the Route 66 motel has since closed, you can still visit the location of the clinic where Charlie takes Raymond on the corner of Oklahoma and Division Streets in Guthrie and the W.S. Kelly Gas Station where the pair stop to make a phone call, located in Cogar about 10 miles south of El Reno. The 1970s action thriller Dillinger tells the high impact story of the “gangster’s gangster” John Dillinger. While you’re watching actor Warren Oates on the run from the law, you’ll see shots of Ardmore, Enid and Nash. Mannsville, Oklahoma was the location of the bridge shootout and they even filmed at the Skirvin Hotel in downtown Oklahoma City, which has been renovated since filming. “Weird Al” Yankovic is known for his pop hit parodies, but he also wrote and starred in UHF, which was filmed entirely in Tulsa. This 1989 sight gag comedy follows the antics of George Newman as he manages a local TV station. Before becoming the owner of UHF, Newman works several jobs including as a cashier at the fictional Big Edna’s Burger World, the real-life location of Billy Ray’s Catfish & BBQ. Bringing Up Bobby stars Milla Jovovich as a loving mother with a criminal record. In this heartwarming story, her longing to give her son a normal life leads them to Oklahoma. 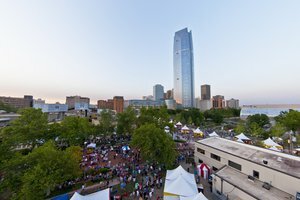 You’ll see shots of Leadership Square in downtown Oklahoma City as she pulls off cons. Also of note, the production crew spent an evening filming in POPS, an iconic diner along Route 66 in Arcadia featuring hundreds of soda flavors. The slasher movie craze of the late 1970s and early 80s didn’t escape the Sooner State. 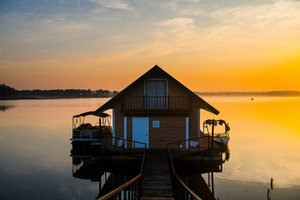 Pop some popcorn and watch this horror movie set at Oklahoma’s beautiful Lake Tenkiller in Cookson. While Tenkiller Dam and Gore road signs can be seen as the heroines drive through the surrounding hills, some of the film’s scenes were also shot around nearby Fort Gibson Lake. Listen for the movie’s fictional tale of “Tenkiller” – an Indian maiden who killed ten brave warriors of a neighboring tribe and whose spirit now resides at the bottom of the lake. In real life, Lake Tenkiller was named after a prominent Cherokee family that owned a ferry service near the location of today’s Tenkiller Ferry Dam.